Hon Doi Cliff (Mũi Hòn Đôi) on the Hòn Gốm Peninsula, Vạn Ninh District is the easternmost tip of Vietnam's mainland. The province is mostly mountainous. The highest peak is Vong Phu Mountain (2051m) at the border to Đắk Lắk Province. 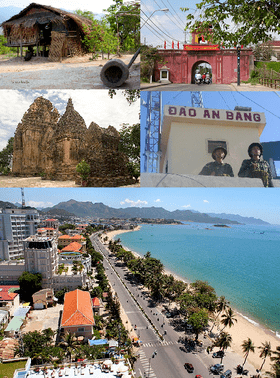 The only large lowland area is located around Ninh Hoa town in the north of the province. Partly as a result of this, not much land is available for agriculture. 87,100ha or 16.7% of Khánh Hòa's total area are used for farming, one of the lowest shares in the South Central Coast. Forests cover more than half of the province's area. As of 2007, the province had a population of 1.147 million, of which the majority are Kinh or Vietnamese people, the dominant ethnic group in Vietnam, who speak Vietnamese, an Austroasiatic language. Minority groups dwelling in the province are the Cham Raglai people, the "Overseas Chinese" Hoa people, and the Austroasiatic-speaking Koho people. They are further subdivided into 6 commune-level towns (or townlets), 99 communes, and 35 wards. Industrial production is not only in and around Nha Trang. The province has also benefited significantly from investment related to the former Russian naval base at Cam Ranh, to which around 30 factories were attached. A major new industrial center is being developed in the north of the province around Van Phong Port (Van Phong Economic Zone). As a coastal province featuring several natural deep water bays, Khánh Hòa has what is needed to develop its deep-water seaports. Nha Trang Port (a tourist and cargo port) and Doc Let Port (a shipbuilding and logistics port) are now in use. Van Phong Port, a megaproject intended to be developed in Van Phong Bay by a consortium of Japanese corporations (with Sumitomo as the leading investor) with an estimated investment of US$15 billion (15*10^9) is in progress. On completion, this deep sea port will be capable of handling ships up to 100,000 tonnes and of 100 million tonnes of loaded/unloaded cargo per annum.